This foldable bike stand is compatible with most bikes. Adjustable height can fit wheel size 24 - 29 inch. 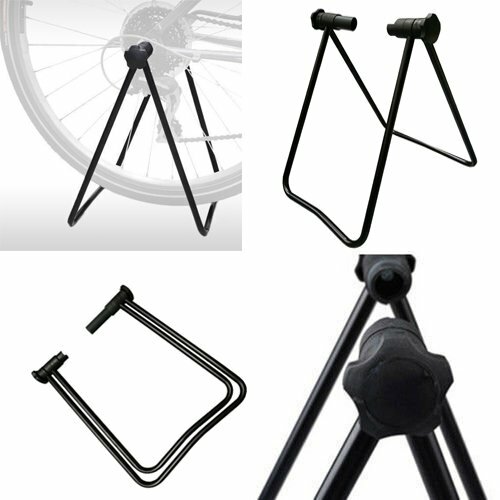 This foldable bike stand is easy to store when not in use, easy to pack for touring and easy to setup when needed. The distance between the mounts must be greater than 6 inches and this bicycle stand can be used. Made of aluminum alloy and ABS, durable and strong. Screw knobs with a tightness-adjusted screw on both sides to unfold, fold or fix the two legs. Perfect for different bike types,Adjustable Steel Stand Lifts Bike for Repairs, Parking, Cleaning, Maintenance, Storage and More. Can fold flat, taking up no room and is dead easy to use and setup. If you have any questions about this product by Vilobyc, contact us by completing and submitting the form below. If you are looking for a specif part number, please include it with your message.